It is safe to say that most people love dogs and probably own one or more. This means that the majority of people are the perfect audience for the cool list of images below. It is not even necessary to love canines, because even if you never had a pet, you will still love these images and the amazing nature of the Great Dane. They are among the most extraordinary dogs in existence and the reasons for that are numerous! Check out the list and enjoy it! We know you will, because everyone would be amused by seeing a lapdog weighing at more than 150 lbs. Still, Danes really love to cuddle and to receive love and affection in every possible minute. It is not surprising to find a Dane sleeping on the couch which is a problem unless you have a really big couch at home. 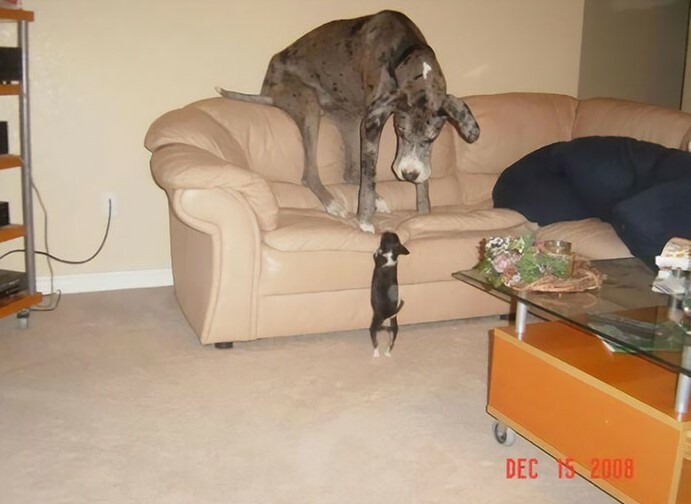 One of the most common things that people assume when they see a Great Dane is that the dog is dangerous because of its intimidating looks. The size of the breed is probably the thing that really makes them stand out in the eyes of those who are not familiar with dog breeds. However, the truth is that all Danes are actually huge puppies! Despite they can grow to be as tall as 30 inches between their paws and shoulders, their personality is as friendly as possible. 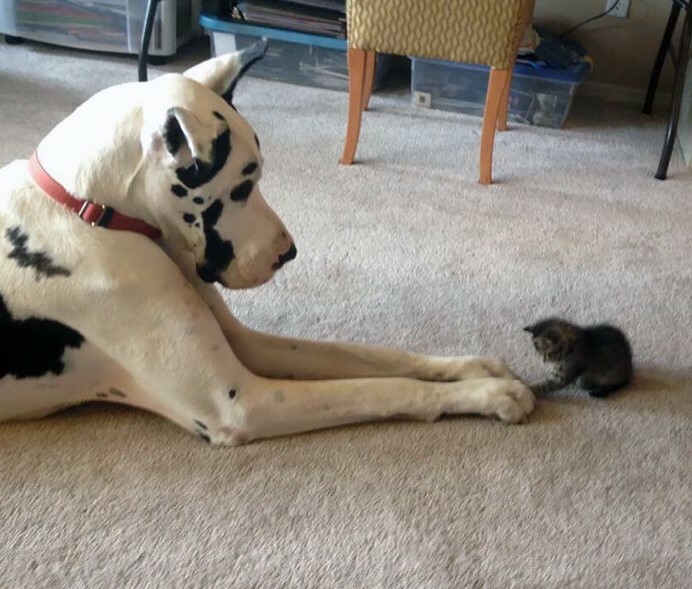 You can see how this giant treats he tiny kitten! 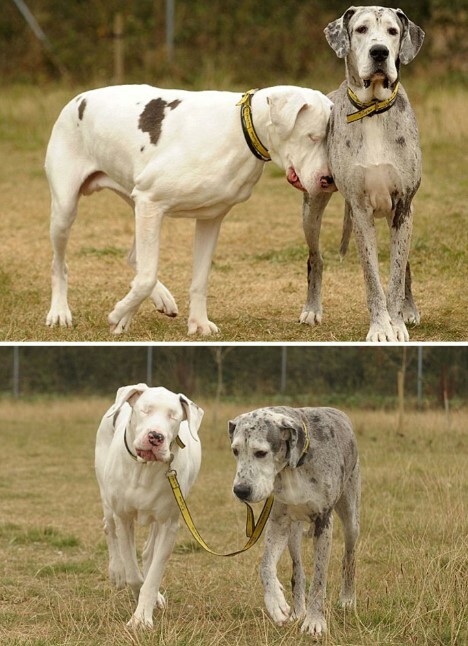 Here is one sweet story about two Danes which are a beautiful sight to see. Lily is blind and she needs help in order to make her way around and go for walks. This is where Maddison comes in! He has his eyesight and is able to walk Lily around and keep her safe! Blind dogs still have their other senses and they could be more or less independent but guidance would be appreciated every time! Most parents who have no idea about what a Great Dane is would be terrified by its looks and would never leave their kids in this dog’s company. But they would be wrong because Danes love children. 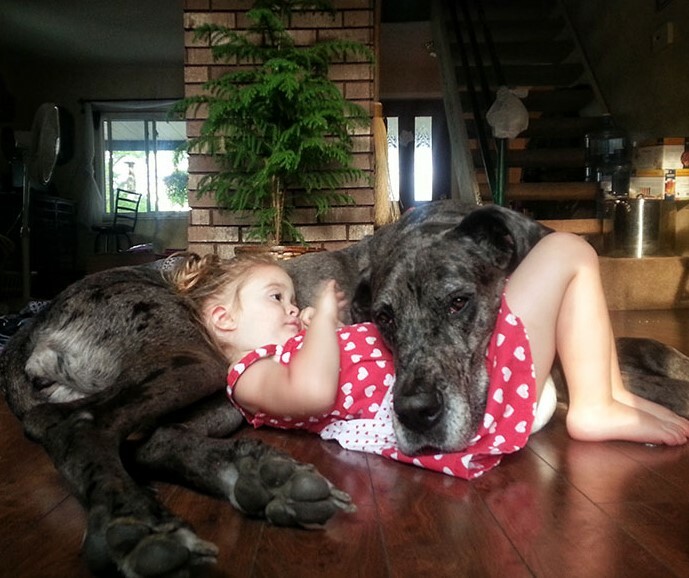 As you can see, this Dane did his best to provide comfort for this cute girl’s nap time! Danes are extremely gentle animals and they can be the perfect babysitter! Every toddle would be fascinated by the dog’s looks! This means that you will probably be relieved from parenting for at least a couple of hours. This photo is really cute and we loved it the minute we saw it! Scooby-Doo is one of our all-time favorite cartoon characters and seeing a dog that looks exactly like him is amazing. However, after studying the photo for a couple of minutes, we decided that it might not be genuine! Take a look at those spots! We believe that the owner of this super cute canine probably painted them on it fur because they appear to be too perfect! If this is the case, we simply cannot approve it! 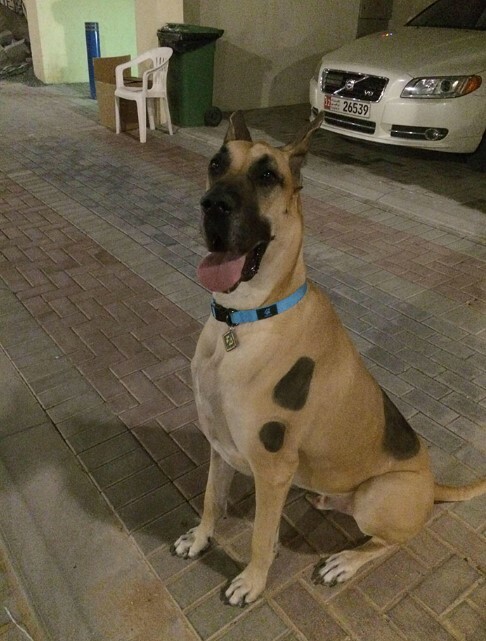 The dog is beautiful and it still looks like Scooby-Doo with or without the spots. This breed is amazing in many ways and one of them is definitely the intellect they have! Danes are loyal and smart and you can teach them basically anything you want. Most people settle with the basic commands but some people tend to be extra about it. 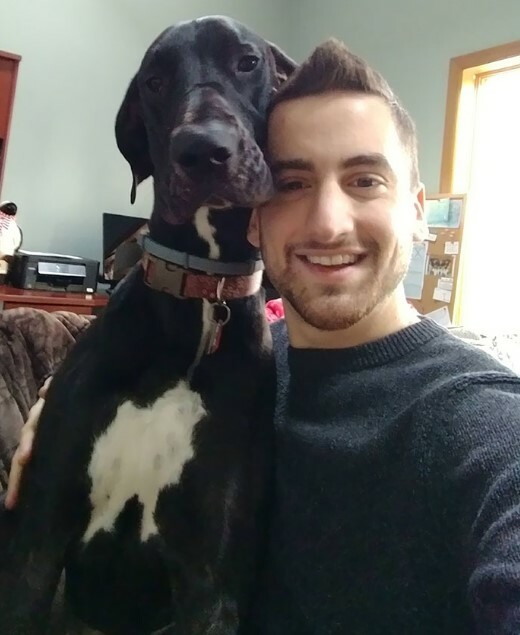 As you can see, this man perfectly trained his Dane to take selfies with him! The clever girl knows what to do when he extends his arm while holding the phone. She goes next to him and makes a super cute face which would win any selfie taking contest for sure! Now we want a selfie with a Great Dane, too! This is definitely one of the best photos on the list! It feels a bit extraordinary for some reason and we are not sure why. 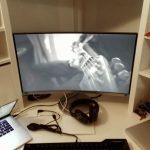 Maybe it is the whole setup! It looks like two best friends met and sat on a couch to discuss the finer things in life and to relive some old memories they had together. Hey, you know what? 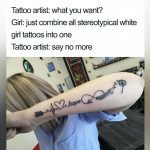 Maybe this is exactly the case here! Of course, the Dane is not able to speak or give an opinion, but it can demonstrate its emotions, love and affection. After all, this is what matters the most, right? The woman on the left looks very happy to have the Dane as company. The dog also appears to be comfy. As we already mentioned, the size of the Danes is more or less deceiving. They are not as menacing as they might appear. In fact, these cuties act exactly like puppies in most cases! They can fool around all the time and if you spend time with them, you will be able to witness tons of hilarious things! Take a look at Hendrix! 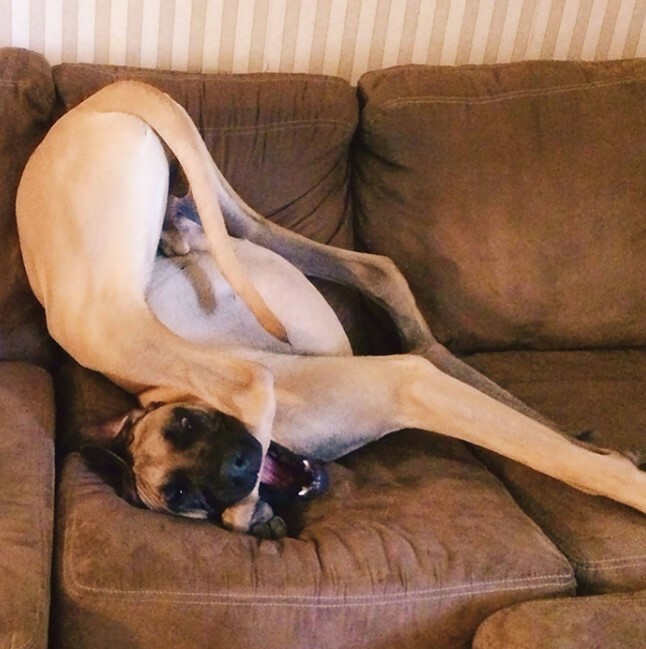 He is the goofy Dane from the photo above! As you can see, Hendrix is gracefully munching on his own leg and the stunt he pulled off to achieve that positions is a priceless thing to see. 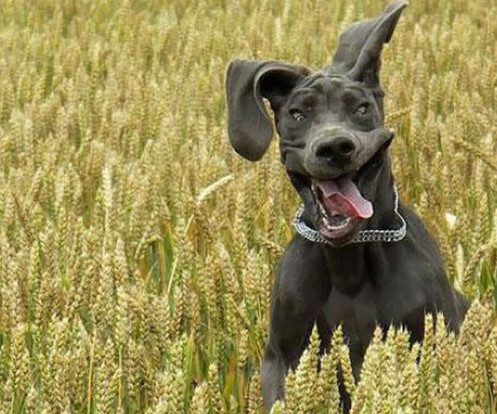 There is hardly a dull moment when a Great Dane is around! If you never met a dog like that before, we suggest you do because you are definitely missing a lot! This photo is truly amazing for a number of reasons! First of all, have you ever seen a photo of a dog biting into a basketball? That’s right, you haven’t! Second, it gives you the right perspective of the breed’s size. 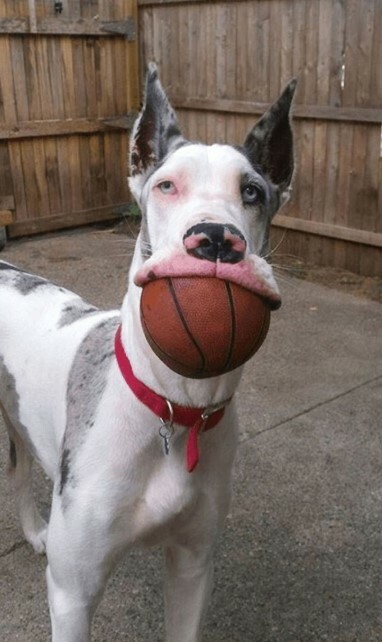 Imagine how big the head and jaw are in order for the doggo to bite that basketball! And last, but not least, it shows you what the breed is all about. They are beautiful, graceful, smart, playful and always ready for action! This particular Dane has mesmerizingly beautiful eyes, too! 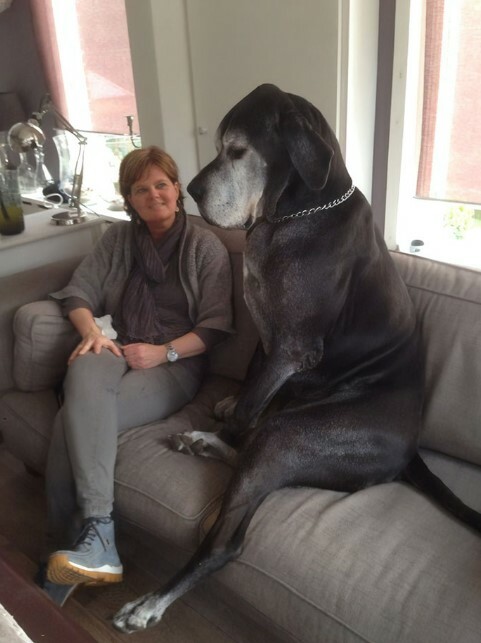 We already mentioned that Danes are just pups in giant bodies. Maybe their consider themselves to be much smaller than they actually are because they tend to act like lapdogs. 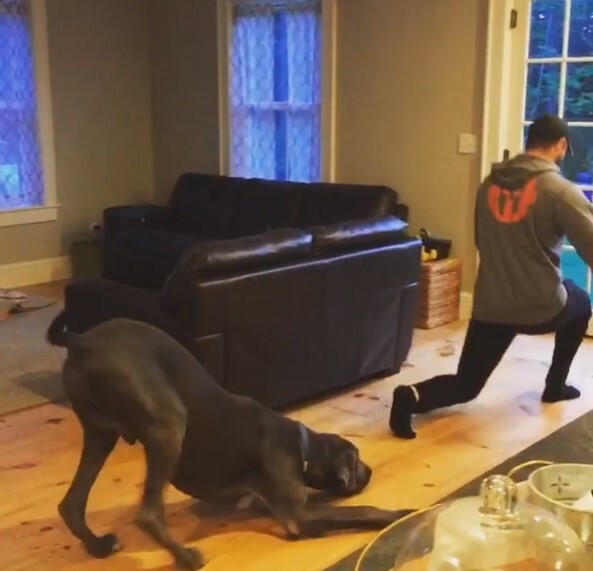 The reasons why it is hard to put a Dane on your lap are more than obvious! The photo above also suggests that Danes are sweethearts and they are not aware of their size or weight. What we see is nothing else than two puppies playing together! And the best part of the image is the Dane’s facial expression! If this doesn’t make you laugh, nothing will. Animals are able to form all kinds of unlikely bonds and this example is not an exception. Pippin is an abandoned deer who definitely needed to be taken care of. This is when Kate comes in! 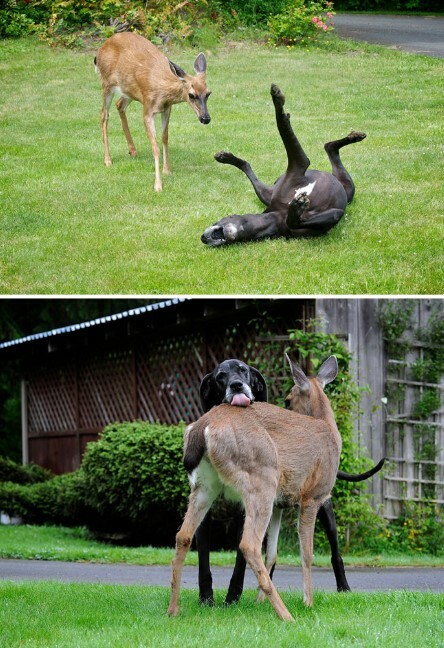 The amazing Great Dane immediately adopted the deer and the two of them became inseparable! As you can see, they really do have a close bond and this is amazing to witness. Danes are kind-hearted and they can form a strong bond with all kinds of creatures. This funny photo really creates an unlikely illusion. 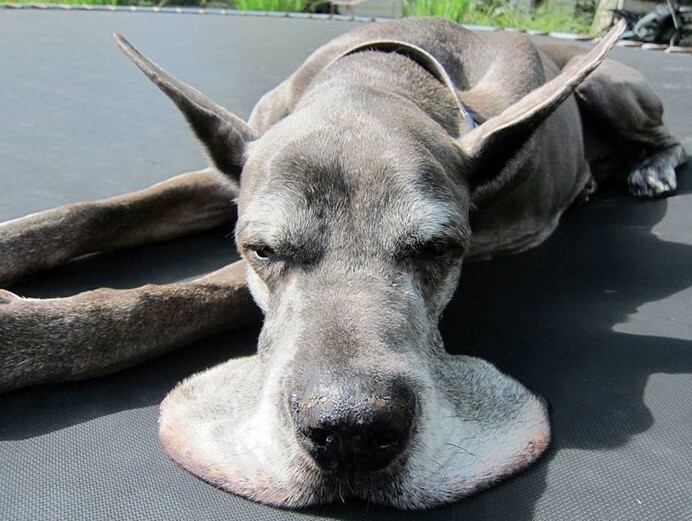 Dogs cannot melt and everyone knows that! However, we believe that anyone who has seen a Dane or owns one knows how this optical illusion was created. The Dane’s cheeks are massive, just like everything else is. When the Dane sleeps, the cheeks often look similar to this photo, so nothing unusual here. Of course, it is always funny to see these giants in similar positions. Great Danes look impressive! They are stunningly beautiful and graceful dogs and they can grow really big. But have you ever seen a Dane puppy before? The pup is absolutely gorgeous and we are definitely in love! Just look at those floppy ears and the face! 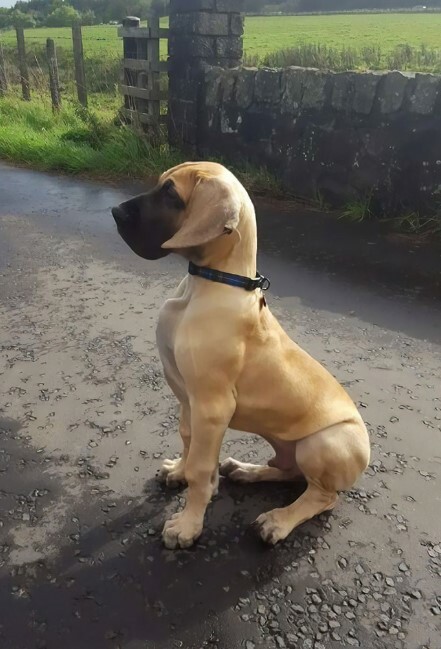 The proud posture shows that it will grow to be a really stunning Dane! Imagine how cute and playful this little fella would be! We are convinced that some of you would definitely consider getting a Great Dane! It just might turn out to be the best decision you ever made!